A friend of mine who has a large family had this giant casserole dish that was larger than your traditional 9X13 pan. With our growing family I can’t just make one 9×13 inch pan anymore for dinner, we needed a little more so this dish was perfect it is 15X10 inches. This is a wonderful size for feeding a large family or entertaining a crowd or just cooking more of anything you want. It’s a great invention, why I didn’t know about it sooner is beyond me but hopefully since I’m telling you about it, means you’ll have the inside scoop on some awesomeness. Here’s the one I bought, this one comes with a lid which I like so I can store things in it or transport it easily, here’s a link for just the casserole dish without the lid and it is a bit cheaper. I haven’t really looked in stores to see if they sell this size but it’s worth a try. Do you remember my recent post I did with a recipe for Delicious Roasted Vegetables? 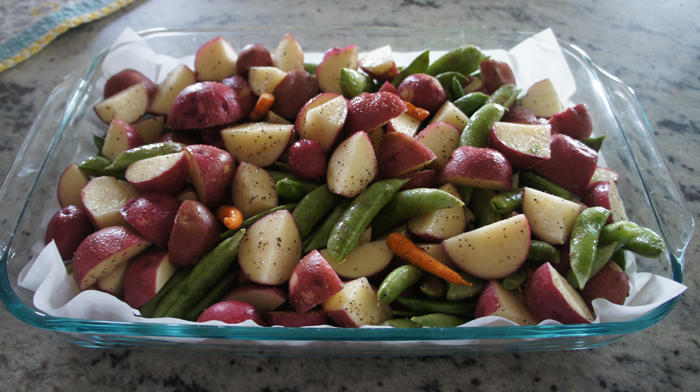 I used this 15X10 inch pan or those veggies.